Invasive Species Ireland > What can I do? > Be Plant Wise > Are you a gardener/pond owner? Ponds can turn a garden from good to great. They create a wonderful feature to be enjoyed all year round and are oftena haven for wildlife. However, if they are not cared for properly some common pond plants can take over your pond. They can also become established in the wild, where they can smother our native plants, clog our waterways, exacerbate flooding and remove oxygen from the water which can harm fish. This website gives you more information about some of the most invasive species threatening our environment. 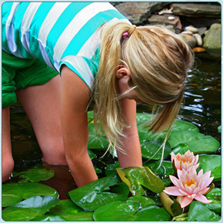 It also tells you how to dispose of unwanted plants properly and how to get the best out of your pond. By following three simple steps we can all help the environment and reduce costs. A selection of aquatic plant species which can cause problems in the wild.